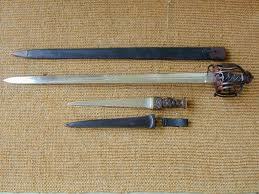 For more selection of Scottish weapons, a basket hilted broadsword, and a drik. The basket hilt would work well with the diamond V7 blade, running at a length of 36", the blade being 31", both are easy and accessible for melee combat for people who are, or are not using scottish styles of combat. The dirk could run a 12" blade, and a 5-6" hilt.